Firefly: Bad Company #1 Review – AiPT! Great artwork and an enjoyable story that sadly bears little resemblance to the character from the Firefly series. 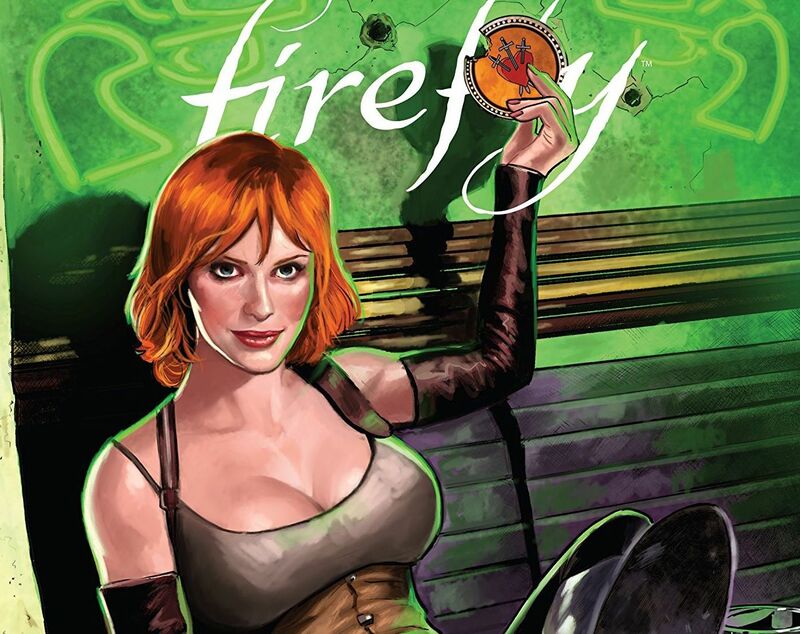 If you are a Firefly fan, than you definitely remember Saffron, the villainous character that Christina Hendricks played to sultry perfection. Now thanks to writer Josh Lee Gordon and a team of artists (Francesco Mortarino, Giuseppe Cafaro, and Moy R.) we get a chance to see her origin/background…kind of (minor spoilers ahead). Things kick off with a pretty standard “little-kid-on-the-wrong-side-of-war” coming of age story. If you never felt any sympathy for Saffron before, then you definitely will after this. Even though she was never personally involved in the war between the Alliance and the Browncoats, her life was undoubtedly affected by it. Later, we get to see how she got all that companion training, once again set against a backdrop of a life that is far from ideal. This eventually leads to her taking some legitimately drastic and impactful action, both for herself and the Alliance at large…which then leads us to the present day, where things might not exactly have occurred the way we were led to believe. The artwork is fantastic, particularly in the final sequence that takes place in the present. I’m normally not a fan of one story rotating through multiple artists, but in this instance, it gives each part of Saffron’s tale a unique feel. The art team also does a superb job making sure everything still feels cohesive from one section to the next. If you liked the deliciously villainous take that Hendricks brought to the character on Firefly, then this might not be the book for you. Instead of Saffron being someone that should be feared and mistrusted, you actually feel sorry for her. Even her treacherous acts are done out of good and/or somewhat noble intentions. This trend continues through to the current time period, where Saffron has a chance to throw someone under the bus like she always has (you’ll know who I’m talking about) to save her own skin and doesn’t. As if that weren’t frustrating enough, we find out that everything we’ve learned might not be entirely accurate. It shouldn’t be a surprise that Saffron is an unreliable narrator, but that revelation should end up leading to a lot more than it actually does. While this was a good tale–and certainly a beautifully drawn comic–it didn’t feel much like a Saffron story at all. Perhaps it would have been more enjoyable as a story about an original character. I certainly wouldn’t mind seeing Gordon and any one of these artists try their hand at another character in the Firely universe. Don’t get me wrong–it’s still an enjoyable comic. But as a Firefly comic that purports to tell the origin of one of the series’ best characters, it doesn’t quite hit the mark. Despite having three different artists, the book feels cohesive and looks fantastic. ...unfortunately, that tale doesn't feel like any type of story that would involve the Saffron we know from Firefly. Unreliable narrators are fine, but the revelation that they might not have been truthful should lead to a lot more.